The strength of the force of gravity between two objects depends on two factors: the masses of the objects and the distance between them. Earth exerts a gravitational force on the moon, large enough to keep the moon in orbit. The moon also exerts a gravitational force on Earth, as you will learn when you study the tides. The force of gravity on an object is known as its weight. Unlike mass, which doesn’t change, an object’s weight can change depending on its location. For example, on the moon you would weigh about one sixth of your weight on Earth. This is because the moon is much less massive than Earth, so the pull of the moon’s gravity on you would be far less than that of Earth’s gravity. 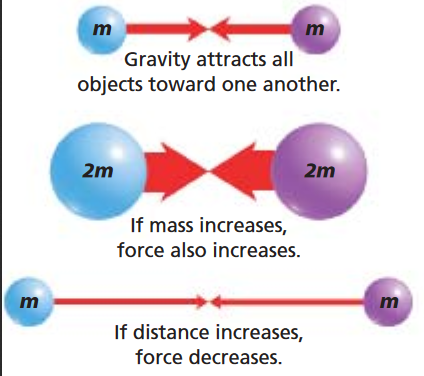 The strength of gravity is affected by the distance between two objects as well as their masses. The force of gravity decreases rapidly as distance increases. For example, if the distance between two objects were doubled, the force of gravity between them would decrease to one fourth of its original value.